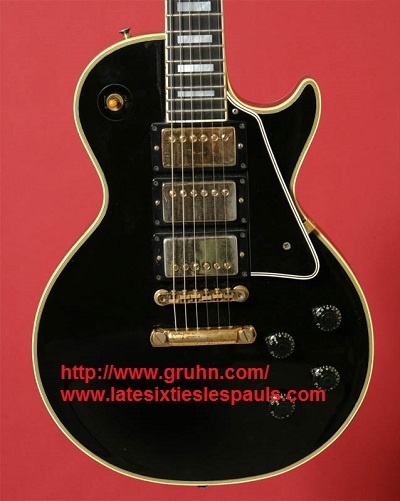 Confirmed, 1961 Shipping Date, Single Cutaway LP Custom - Gruhn Guitars. 1968 & 1969 Les Paul Customs have "inaccurate" sized pearl inlays in the highest three marked positions. This is a sign of Gibson wondering further away from the design of the "best" Les Pauls. Nope. Gibson made the switch probably sometime in 1960 to the "modern" style of having the last three fingerboard inlays become increasingly narrow vs. staying the same width (1954-1960). Gruhn's Guitars in Nashville, TN, USA had this 1961 LP Custom for sale a few years ago. This is as reputeable a dealer as possible, so it is for certain this guitar is the real deal. It clearly sports the "modern" thin, thinner, and thinest high inlays and is probably one of the very last single cut-away Les Pauls produced until June of 1968. Gruhn's Description: "1961, EXF, professionally refretted with medium-jumbo frets (.100"), formerly owned and used by Robbie Robertson of The Band, pictured on page 186 of Norman's Rare Guitars, comes with a copy of the book and a certificate signed by Norman Harris, OHC......$110000"